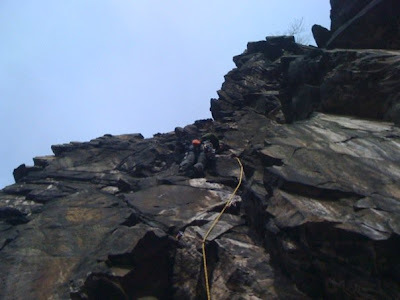 From the belay, I proceeded up the steep wall left of the cave. I picked up a red ball-nut in September & I think I've used it on every trip to HF since. Here it is the placement to the left. There was an old piton near the start of the climb, as well as a stuck TCU higher up- signs of previous passage. The 1st Pitch is shown on Rob Savoye's topo, but without any route info. The 2nd Pitch isn't described anywhere that I'm aware of, but has certainly been climbed before. The route finishes at a single bolt (which you can supplement with gear); we made 2 rapp's from the anchors at Hard-up. For an unpublished route, I found this line to be very aesthetic. As I'm pretty much snowed-in right now, I decided I'd take the time to share. With the leaves fallen from the trees, you can really see just how much rock there is here. After beginning Hard-up, I followed my partner's suggestion to head right at the 'Y' (I would normally head left, moving up toward the lower left corner of the sign). This photo is looking up at the line I was to take, from where the paths diverge. The pitch was well-protected, taking mostly small cams; but I also found a slot for my #3. I finished the pitch on the ledge just left of the cave, near the upper right corner of the sign. I placed several pieces here before committing to a sustained sequence of ~5.9 climbing. It has obviously been too cold and snowy to do much rock climbing in comfort. I was up in Maryland over the holidays and rediscovered a wall I had written off for low rock quality. I was X-country skiing to the top of Maryland Heights via the park service trail and passed above the wall. When I got back down I check it out and bouldered it in my cross country ski boots. There are some loose holds but the rock isn't rotten. The holds have never been used and the surface bits need to be cleaned off. The wall is high at about 15 to 20 feet but has holds that are remarkably gym like. The landing is good but the topout probably needs a bit of cleaning. It is super close to the car and pretty easy to hike up to. Where: Between the two parking lots for the access road/trail to the top of Maryland Heights. These parking areas are along Sandy Hook road upstream of the confluence of the Potomac and Shenandoah rivers. This rock is in Maryland. Park at either lot and find the stream that comes down to meet the road. Look up and right to see a bunch of cliff/boulders that are mostly bad rock. Hike up into the narrow corridor that is only 20 feet below the access road/trail for getting to the top of Maryland Heights. See the Photos for a vague idea of what I'm talking about. The wall overhangs slightly, maybe 10-15 degrees. The old road bed which is the access road/trail for Maryland Heights is about 25-30 feet uphill from the wall.